Ein Teil der Leser wird beim Lesen des Titels gedacht haben, dass es mir wie nur so oft in diesem Blog wieder um Leistungsbewertung und Didaktik geht. Diesen Eindruck wollte ich aber mit dem Titel dieses Eintrags nicht erwecken. Stattdessen wollte ich auf Jon Elsters Buch Making Sense of Marx (1985) anspielen, ein repräsentatives Beispiel der analytischen Lesart von Marx – dabei aber die serbokroatische Rechtschreibung des Namens des Autors des Kapitals benutzen. Wie im Leben, so ist es auch in der Philosophie ein nicht unübliches Phänomen, dass Sprache, Standort, Tradition, Wahrzeichen es einem ermöglichen, die Idee eines anderen effektiver zu vermarkten. Das passierte z.B. mit Asenjos und Tamburinos logischem System, das den Wahrheitswert wahr-und-falsch zulässt. Allgemein bekannt wurde es nur Jahre später als Graham Priests LP. Jugoslawischen Philosophen wie Mihailo Marković und Svetozar Stojanović erging es nicht besser. Ihren analytischen Neomarxismus haben sie formuliert bereits Jahrzehnte, bevor die jungen Intellektuellen, die New Labour wählten, Jon Elster entdeckten. Das Thema der Dissertation von Marković war die Metalogik. Kein anderer als der logische Positivist A.J. Ayer war der Doktorvater, dessen Reaktion ich sehr gern gewusst hätte, als er lies, wie sein Student „Logik“ definierte: „Eine Menge aus Theorien, (i) denen von der Öffentlichkeit Bedeutung zugewiesen wird, (ii) die beweisbar sind, und (iii) die sich auf eine bestimmte Theorie T auf niedrigerer Ebene anwenden lassen“. (Marković, M. (1958), The Concept of Logic, London: Dissertation, S. 1). Stojanović promovierte 1962 in Belgrad über zeitgenössische Metaethik. Das Feld war noch neu und Stojanović hat eine allgemeine Übersicht und eine historistische und relativistische Alternative geliefert (Stojanović, S. (1964), Savremena meta-etika, Belgrad: Nolit, insb. S. 283-322). Warum schreibe ich all das? Weil ich bei meinem letzten Aufenthalt in Belgrad an die Worte eines chilenischen Kollegen, eines parakonsistenten Logikers, denken musste: „Diejenigen, die bei den großen internationalen Publikationen näher sind, lassen dich verstehen, dass sie einen Diskurs führen, zu dem du in der Peripherie nicht gehörst – selbst wenn du eigentlich diesen Diskurs losgetreten hast“. Some of you might expected to read a piece about school grades when they read the title of the posting – say as a follow-up to my former postings on didactics and marks in this blog. But this would be the false impression. I don’t think that one can really make sense of quantified evaluations of the students‘ output. In the title of this posting I’m just alluding to Jon Elster’s Making Sense of Marx (1985), a book emblematic of an analytic understanding of Marx, but I’m using the Serbocroatian spelling of the name of the author of the Capital. Like life in general, also philosophy has many examples to offer about people who, for reasons of language, location, tradition, trade mark etc. managed to distribute ideas of others much more effectively than the original thinkers. This was the case with Asenjo’s and Tamburino’s logic system which allows for sentences to be true-and-false at the same time – a system which became generally known only years later as Graham Priest’s LP. This was also the case with Yugoslav philosophers like Mihailo Marković and Svetozar Stojanović: they had produced pieces of analytical Neo-Marxist philosophy decades before the New Labour intellectuals discovered Jon Elster. Let me only remark that Marković’s supervisor for his PhD-thesis on what today is called epistemology of logic was A.J. Ayer – a logical positivist, of course, whose reaction to his student’s pragmatic definition of logic as „a class of theories which are (i) publicly meaningful (ii) provable and (iii) applicable to a certain lower-level theory T“ I would very much like to know (Marković, M. (1958), The Concept of Logic, London: PhD-thesis, p. 1). 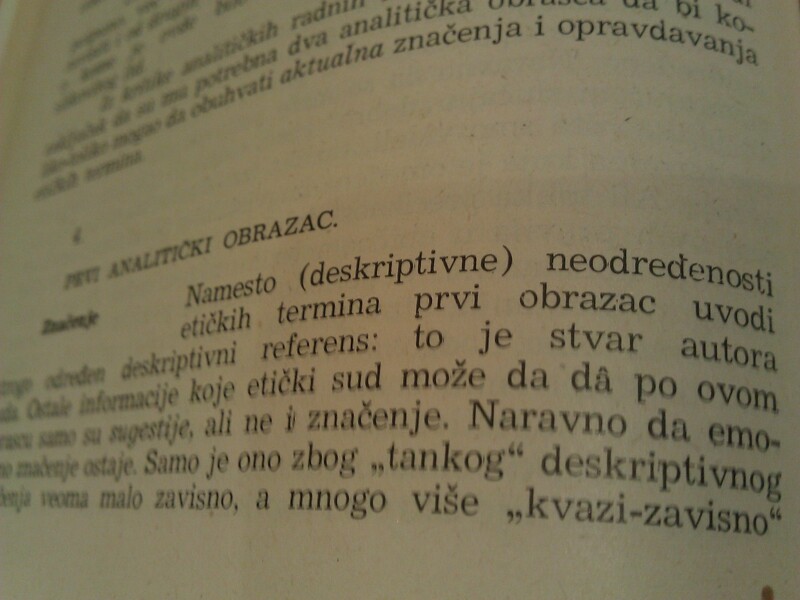 Stojanović’s PhD-thesis Contemporary Metaethics, submitted in 1962 in Belgrade, reviews a back then emerging field of philosophical research taking a historicist and relativistic stance (Stojanović, S. (1964), Savremena meta-etika, Belgrade: Nolit, esp. pp. 283-322). Why am I writing all this? Because during my last stay in Belgrade I remembered what a colleague from Chile, a paraconsistent logician, said to me once: „The ones who are closer to the big international publications want to make you think that they have a discourse and you, on the periphery, are not part of this discourse – even if you’re the one who launched it“. Irland, Spanien und Griechenland haben mindestens eins gemeinsam: das Zukunftsanliegen, auf den EU-Rettungsschirm zu verzichten. Die Eurogruppe gab bekannt, dass Irland und Spanien sehr bald nicht mehr der Hilfe aus dem europäischen Stabilitätsmechanismus bedürfen. Anmerkung für Kollegen: Um den Witz („…es bleibt auch in der Zukunft ein Zukunftsanliegen…“) formalistisch zu erfassen, braucht man eine Zeitlogik, in der Folgendes ein Theorem ist: Es wird immer der Fall sein, dass genau einmal der Fall sein wird, dass p, gdw. 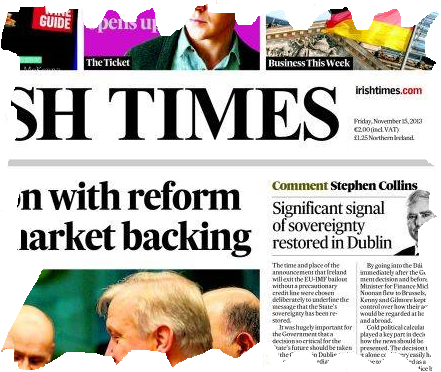 es niemals der Fall sein wird, dass p.
A common characteristic of three countries, Ireland, Spain and Greece, is their future aspiration to exit the European troika programme to safeguard the eurozone. The difference between them is that for Greece it will remain a future aspiration throughout the future. 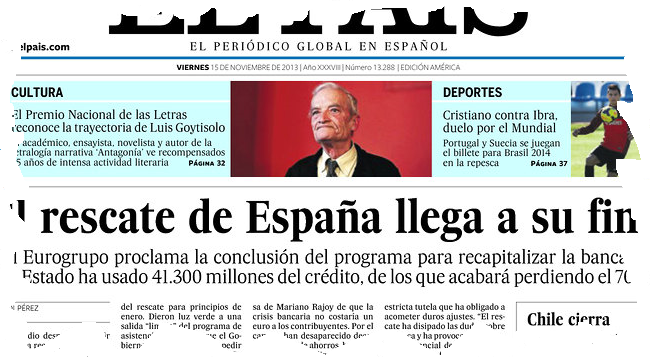 The eurogroup announced that Ireland and Spain will exit the bailout programme without extra credit line very soon. Now, this is for colleagues: In order to formalize the joke („…it will remain a future aspiration throughout the future…“) one needs a tense logic in which the following is a theorem: It will always be the case that it will be the case only once that p iff it will never be the case that p.
…muss wach machen. Diesmal war er unangenehm ernüchternd, zumal er am Ende einer Führung mit vielen Highlights der ungarischen Geschichte kam, darunter mit der Angabe, dass der erste ungarische König István hieß. Systematische Beiträge zur Semantik der Eigennamen habe ich niemals geleistet. Historisch habe ich aber stets die These vertreten, dass es in den natürlichen Sprachen keine Eigennamen gibt. Zwar gibt es Namen, die wir „Eigennamen“ nennen, wie „Ägäis“, „Peter“, „Kunigunde“ usw., aber diese deuten auf Eigenschaften des ersten Namensträgers hin: „Meer des Aigeus“, „Steinharter“, „Sippenwehrhafte“. Bei den späteren Namensträgern handelt es sich um Anwärter des Ruhms eines früheren Namensträgers. Diese These habe ich historisch in einer sehr kurzen Arbeit zu untermauern versucht, die ich zusammen mit dem damals Saarbrückener Sprachwissenschaftler Andreas Schorr schrieb: „Kulturkontakt auf dem Balkan“, in: Borgolte et al., Mittelalter im Labor, Berlin: Akademie Verlag, 2008, 390-391. Insbesondere beziehen wir uns dabei auf mittelalterliche Namen, u.a. auf die Namensgebungs-Etikette des serbischen mittelalterlichen Adels, dessen Angehörige, so jedenfalls die Vermutung, in Anlehnung an die Urbedeutung des griechischen Namens „Stephanos“ (= der Bekränzte; der Gekrönte) „Stefan“ hießen. Dabei maßen wir dem Umstand, dass viele Mitglieder der serbischen mittelalterlichen Königsfamilie auch „Uroš“ hießen, nicht die gebührende Bedeutung bei. Den Namen „Uroš“ trugen sie eindeutig in Anlehnung an die ungarische mittelalterliche Aristokratie. „Stefan Uroš“ war der Doppelname gleich mehrerer serbischer Monarchen. Aber dann ist es sehr wahrscheinlich, dass auch der Name „Stefan“ in Anlehnung an den ersten König Ungarns István I. gegeben wurde und nicht wie Andreas und ich im Artikel vermuteten in bezug auf die griechische Bedeutung von „Stephanos“. Die mit dem Doppelnamen „Stefan Uroš“ intendierte Assoziation diente nicht „römischer Zivilisiertheit“, wie wir schrieben, sondern der Identifikation mit einer ungarischen Erfolgsgeschichte. Pure Eigennamen sind im serbischen mittelalterlichen Adel weiterhin nicht zu finden. Insofern stimmt die These. Sie war aber nicht richtig untermauert. 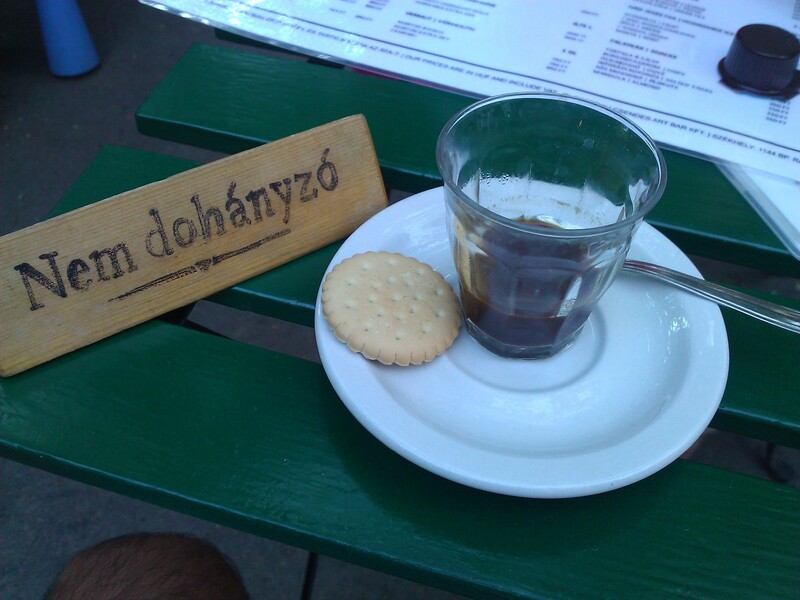 A ristretto-coffee at the cool Magyar útca of Budapest raises the pulse but in this case it made me very thoughtful after a sightseeing with many basics of Hungarian history – among others with the information that the name of the first Hungarian king was István. I have made no systematic contributions to the semantics of proper names. Historically, however, I have been maintaining an original position which says that natural language has no proper names. There are, of course, names like „the Aegean Sea“, „Peter“, „Cunigunde“, which we call „proper“. But these are allusions to properties of the first bearer of the name: „Sea of Aegeus“, „stone-hard“, „the-clan’s-defensible-one“. The subsequent bearers of such names do nothing but insinuate that they are equal to the first bearers. I tried to corroborate this historical position in a very short article which I wrote together with the linguist Andreas Schorr, back then at the University of Saarland: „Kulturkontakt auf dem Balkan“, in: Borgolte et al., Mittelalter im Labor, Berlin: Akademie Verlag, 2008, 390-391. We focused on medieval names, among others on names of the medieval Serbian aristocracy. We thought that most of them were called „Stefan“ in order to allude to the Greek meaning of the name „Stephanos“ (= the crowned). However, both Andreas and I didn’t pay attention to the fact that many members of the royal family in medieval Serbia were named „Uroš“. This was due to a strong influence they received from the Hungarian aristocracy. Some kings of the medieval Serbian state had the following two names: „Stefan Uroš“. 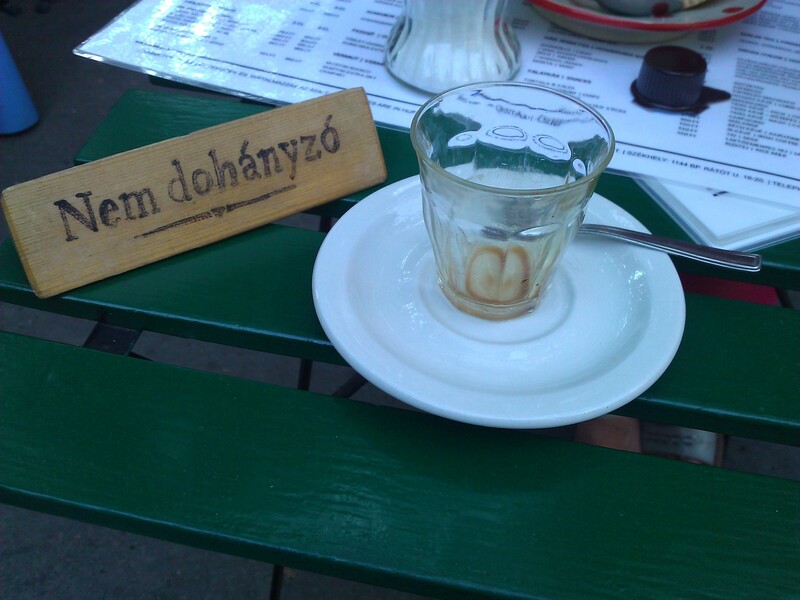 But „István“, the name of the first Hungarian king, is a Hungarian form of „Stefan“. Thus, unlike what Andreas and I maintained in the aforementioned article, it seems quite plausible that the name „Stefan“ wasn’t given to allude to the Greek meaning of the word but, like „Uroš“, to a Hungarian success story. Of course, if the name „Stefan“ was a way of a king to say: „I am as good as the first Hungarian king was“, it is still not a genuine proper name. But our argument for this wasn’t correct. Anders als bei der relativ leichten Bestimmung der Ansichten griechischer Philosophen (vgl. hier), ist es sehr schwer, die Ansichten griechischer Philosophinnen richtig einzuschätzen. Die gute Nachricht ist, dass es mit einem von mir entworfenen Test möglich ist herauszufinden, ob sie radikale Linke sind oder nicht. Die schlechte Nachricht ist, dass die Aufgabe, mehr über eine griechische Philosophin herauszufinden, ein besseres Kennenlernen erfordert. Frauen sind komplizierter. 1. Fragen Sie sie, was ihre Ansichten zur moralischen Philosophie sind. Keinen Punkt ergibt die Antwort: „Moralische Probleme sind für die Religiösen. Ich sehe keine moralischen Probleme, sondern ästhetische Probleme einer bestimmten Art“. Einen Punkt ergibt jede andere Antwort. 2. Fragen Sie sie, was sie von Chomsky hält. Keinen Punkt ergibt jede Antwort, die folgendermaßen beginnt: „Ach der Noam! Also er …“ bla-bla-bla. Jede andere Antwort ergibt einen Punkt. 3. Verlangen Sie von ihr ihr Lieblingsrezept für Mussaka. Wenn sie zurückfragt: „Mussa… was?“ dann bekommt sie keinen Punkt. Für alles andere gibt es einen Punkt. 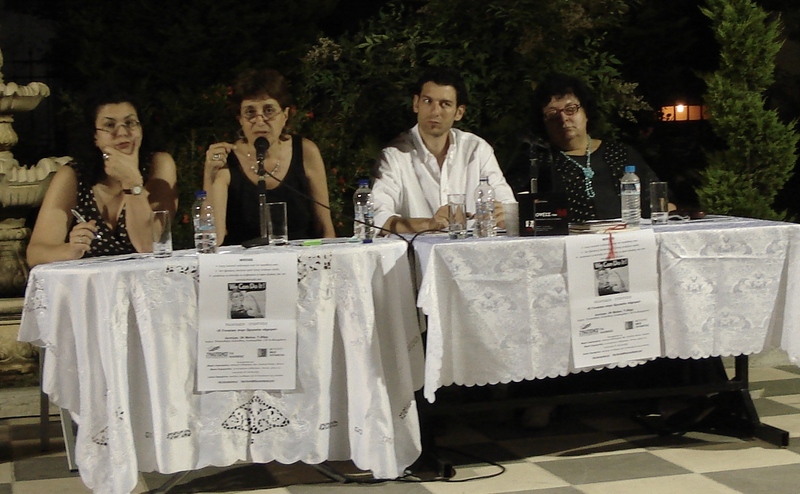 Wenn die Summe gleich null ist, dann handelt es sich bei der Befragten um eine radikal linke griechische Philosophin. Bei jeder anderen Summe ist sie es nicht. Zu erwarten wäre, dass etwa 60% der befragten Philosophinnen eine Nullsumme erzielen. Unlike the determination of the views of Greek men-philosophers (cf. here) it is not possible to determine the views of Greek women-philosophers with reference to clothing or accessoires. The good news is that you can determine whether they are radical leftists by using a very brief questionnaire – a test developed by me. The bad news is that there is not much more you can determine during the short period of the WCP 2013. Women are more complicated than men. 1) Ask her what she thinks about moral philosophy. Give her zero points if she answers: „Moral issues are for the religious. I see no moral issues. I only see esthetic issues of a certain kind“, and one point for any other answer. 2) Ask her what she thinks about Chomsky. Give her no points if she introduces her answer by saying: „Oh Noam! Well he…“ bla-bla-bla, and one point for any other answer. 3) Ask her what her favourite moussaka-recipe is. Give her zero points if she asks back: „Moussa… what?“, and one point for any other reaction. Any Greek woman-philosopher with a score which equals zero would be a radical leftist. She is no radical leftist by any other score. The expected results if the test is carried out many times at random would be about 60% of participants with no points. I hope that this is helpful for the colleagues who are visiting Greece in the time to come.